High Quality Content by WIKIPEDIA articles! 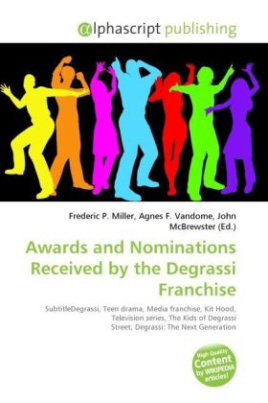 This is a list of notable awards won by Degrassi, a Canadian teen drama entertainment series and media franchise that depicts a group of student facing the typical issues and challenges of teen life. The Degrassi fictional universe, created by Linda Schuyler and Kit Hood under their production company Playing With Time, is the setting of four television series that began with The Kids of Degrassi Street in 1980 and continues with the current series, Degrassi: The Next Generation. A 1992 television movie and 1993 documentary mini-series, and a number of other media including books and internet productions complement the franchise. Spanning twenty-seven years, Degrassi has won many different awards, including twenty Gemini Awards, three Parent's Choice Awards and six Directors Guild of Canada Awards. In 2005, Degrassi was the subject of a CBC Television Gemini Special as the "Top Canadian Show of the Last 20 Years", while its latest incarnation was the first Canadian series to be awarded the Choice Summer Series at the Teen Choice Awards.